Villa Bianca, surrounded by a delightful garden, is the ideal place to spend relaxing moments enjoying a wonderful sea view. The villa, that can accommodate five people, is located close to the popular seaside resort in the province of Palermo, Balestrate. Its coast is characterized by golden sandy beaches and typical Mediterranean vegetation along the crystal-clear sea. 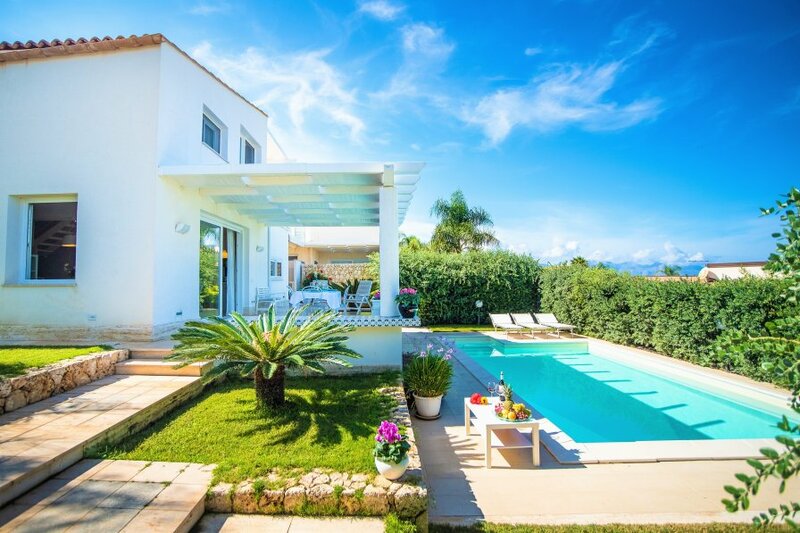 The villa is designed in a Mediterranean style; it extends over two levels; you enter inside from the large and bright living room with sea and pool view. Rooms are designed with abundant open space, comfortable and elegant at the same time, both in the furnishings and the choice of colors. From the veranda fronting the living room, the guest can admire the enchanting sea view and enjoy the breeze that in the evening will give you a pleasant coolness. On the ground floor there is a bathroom. The first floor is reached by a staircase that leads to the sleeping area consisting of three bedrooms, two double bedrooms and one single bedroom. The adjacent bathroom is with shower. The master bedroom has a terrace where you can relax or have breakfast in front of a beautiful landscape nicely. The beach is situated immediately below the house, just 500 meters away and it is partly free and partly equipped to shore.